What a shame for corporate titans who saw their golfing buddies moving huge portions of their businesses offshore to reduce their labor cost. They saw their best friends being able to move their businesses offshore to take advantage of lower wages and additionally, their buds also got "less punitive" environmental conditions. They hoped they could figure out a way that they could create a labor force that was similar to those offshore, but the required their company to stay in America. Despite all the odds of probability plus a negative factor known as the US Constitution, amazingly, they succeeded. They wanted all of the advantages and none of the disadvantages of offshoring for their companies. They wanted a cheap labor source and a labor force that would not complain at all about the work environment. The overriding problem of course for US home (can't go noplace else) industries such as farming and meatpacking, and even construction was that companies that require "American" workers in America cannot offshore the work to other countries. What a problem! These businesses were stuck in America and therefore, they were forced by geography to hire American workers. Not so fast! How was that unfair to the entrepreneuers? Not many of us talk about the devastation that taking jobs from America causes to American families. How unfair to American families? Suppose, for example, your company packs meat from animals raised on US land or suppose you are selling berries or vegetables grown on US land, or you are building homes in the U.S. You cannot very well take your enterprise offshore. It cannot work. The poor corporate titans in these unfortunate industries were not able to gain the benefits of offshoring. They knew that it would only be possible if magically, the Chinese and Indian workforce, who were the popular target destinations for US outsourcing, would be willing to work for peanuts in the USA. Eventually US capitalists did not care if it were Chinese or Indians doing the work, as long as they were not Americans. So, they may not have been Chinese workers or Indian workers but the workers came from non-citizen countries nonetheless, and they are still coming. The US government solved the problem of no labor arbitrage by taking no action when illegal foreign nationals took American jobs. The companies seem to be able to hire illegals with impunity and profits never looked so good as wage rates became as depressed as in the Robber Baron days. Somebody is being taken advantage of, and somebody else is out of a good job, but a corporate titan is now able to share in the bounty of offshoring without even moving the company. When the government took no overt action to stop the practice during the last several administrations, its non-action was enough to put a big smile on an industry mogul's unkind face. They knew they coul hire at dirt cheap wages, and the Federal Government would not prosecute them for anything. They were right. With the government choosing not to enforce illegal immigration laws, companies thus became able to create little pockets of employment that had almost all of the "business friendly" characteristics and the big benefits of third world countries right here in the good ole USA. Yup! because of lax government policy intended by the Republicans to give businesses, who could not offshore, the financial breaks they needed to equate them to thos who could offshore, life was good. Huge corporations were able to find labor arbitrage opportunities that had not been seen since the Robber Baron days. Yes, it was right here in America. Just as in the Robber Baron times, all the workers suffered and they still suffer. Government is the big perpetrator for permitting corporations to act irresponsibly. The story of the meatpacking industry is an egregious affront against the American way. We all seem to think that all illegal immigrants pick berries or vegetables or otherwise work on a farm. This is not true. The once highly unionized labor force in the meatpacking industry for example commanded 25% higher wages than other manufacturers. In the early days, meatpacking was an undesirable profession because it was dangerous work and because the wages were depressed. With the union influence, meatpacking became a desired job especially for new legal immigrants from all countries. Paying such good wages however soon was too good for companies like Swift and Tyson's and others, so they figured a way to get back to slave labor wages. They shut down their city operations and moved the plants to the rural parts of the country. Their union workers for the most part chose not to go with them. That was their plan. A huge proportion of those who lost jobs were black Americans and because of the great wage, which they had been receiving, they had been able to lift themselves into the middle class. It was too good to last. When the meatpackers opened their new facilities in rural areas, the plants opened as non-union or were about to be. The wages were close to half of what the employees had been receiving when the companies were all unionized. Along the way, the meatpacking industry, which had decided it no longer wanted union shops, came up with a lot of tricks so that unions were never again able to take hold of their industry. Illegal foreign nationals as workers was one tool that management used since no business person worried about an illegal alien joining a union. It would be almost certain deportation. Just like the government has begun to lie at a wholesale level, company managers and executives learned to lie so that they could keep their profit margins and they could also avoid jail time. The Immigration and Customs Enforcement (ICE) people did come around, but not too frequently, and most of the time, they came after having been announced. There were few surprise visits. Few got caught because the government intended for few to get caught. When companies are asked, even today, about their workforce, they are quick to verify that they have no illegals working on premise. Of course, they lie. Here is a great story that demonstrates this. A few years back, the Swift Plant Managers in Greeley Colorado were informed that ICE would be a calling soon. Why ICE would tell them they were going to be raided is another part of the problem and all of US should be annoyed at that. ICE knew and we know that all of the meatpackers in recent years were using illegal aliens (foreign nationals) as a major part of their workforce. So, when informed by ICE that a raid was imminent at its plants, Swift immediately went before a judge to ask for an injunction to prevent those raids. Why would that be? When they got to court seeking injunctive relief, Swift told the court that the raids could severely impact its ability to conduct business. The company argued that it could lose up to 40 percent of its workforce and this would compromise its ability to continue as an employer. This is verifiable by checking Swift's court documents. The funny thing here is that Swift had always claimed that it had never knowingly hired an illegal worker so the idea that they would be harmed in any way was counter to their prior testimony. They lie. Government lies. The people pay. Of course we know and the workers know they lie. The bottom line is that if the company believed it had no illegal workers then where did the 40 percent loss in its workforce estimate come from in a potential immigration raid? Again, the answer is they lied. Those looking at the meatpacking industry over time know that no amount of raids at Swift would ever stop Swift's Greeley plant and other plants from being work havens for illegal immigrants. There is just too much money at stake. Since nobody goes to jail, the inconvenience is merely a cost of doing business. Why does the government make it so easy? Who does the government represent? How about fruit, berry, and vegetable pickers? It is a similar scenario to meatpacking and even construction but there are more legal ways to get the job done in those industries. Yet, there are still lots of illegal foreign nationals working on farms and doing the building of buildings. Obviously farmers cannot offshore their business so they do the next best thing. They find the cheapest labor in town. So, it is possible to bring all of that cheap labor to the farm without having to move the farm. Of course we know the farm cannot be moved and there is an ample supply of illegal aliens to fill the bill. This is a real coup for businesses that cannot go offshore. Corporations are able to pay substantially less than the prevailing wage to gain the labor supply they need. It is really not good for Americans and it is certainly not a real good thing for the impoverished workers. Today everybody seems to understand that offshoring is the sending of American Jobs to another country and leaving the Americans who once had those jobs out of work. There is an argument that we just presented that most meat and poultry workers, farm workers, and construction workers, whose jobs cannot be outsourced are victims of labor arbitrage with no union protection. Theor employers bring in foreign labor and the US governemnt hopes that they stay and one day vote for them. Workers in manufacturing and now customer service industries, as well as IT and Accounting are witnessing massive job depletion by offshoring. So entrenched US industries use illegals for labor arbitrage and healthy corporations that are not bound to the US, simply take the jobs overseas to third world countries. .With the major influx of foreign nationals a.k.a. 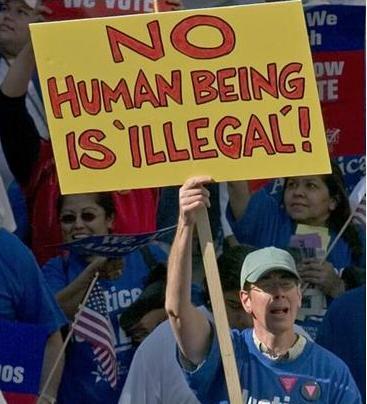 illegal aliens, those corporations that cannot offshore do the same thing onshore. They have been able to bypass labor laws and they have been able to craft a “third world” strategy for the U.S. meat and poultry industry, as well as many other industries. So, why did I take you through all that? The solution is actually very easy. I love the notion of cybernetic systems. As a computer systems engineer, I tried to build self correcting attributes into all the systems I designed. I think the government missed its opportunity years ago of dealing effectively with border jumpers who become illegal workers. But, no problem is beyond the thinking of a problem solver as long as we want to solve the problem. Years ago I knew the problem with illegal immigration was these folks somehow all got jobs. Now, they get all the jobs. Neither of those scenarios are good for Americans. The illegal worker would be long gone if nobody hired them. BTW, that is another reason why a consumption vs. an income tax would help. Everybody would pay some tax, including the visitors. Illegal immigrants can't all be on welfare no matter how good the identity theft business has become. So, we must conclude they have jobs and that American companies are paying somebody off, or they are paying off their books, or they are permitting anybody to work and they are winking and nodding and all is OK. The solution is very simple and it would put so much money in the US treasury that neither party would ever want to make citizens of the "illegal alien," Moreover, no business would want to hire anybody other than an American, their new preferred worker. It would increase the opportunity for American citizens to be employed in the industries in which the illegals have downgraded the wages. 1. Amnesty for all employers who admit they have illegal immigrants working for them. 2. As part of the amnesty the company provides the number (not the names) of the employees who are illegal who may be illegal. I am OK with providing names but this is not a trick to discover identities for deportation. 3. A new $5.00 per hour payroll tax is imposed by the Federal government on each employee who is not a citizen. Companies report hours quarterly along with their 941-A reports. 4. The current employees wages cannot be cut ever. 5. Any new jobs are to be filled by verified Americans. Americans can keep the $5.00 differential. If an American has the job, he or she keeps the $5.00. In other words, Illegals make $5.00 less per hour but the company pays the same. 6. The tax money goes into state unemployment funds and/or social security. 7. Either the companies continue paying the employees the equivalent of $5.00 more per hour (with the $5.00 going to Uncle Sam) or they hire American citizens. The demand for American citizens will push the labor rate up so that Americans can again be employed in meatpacking, construction, and even in the farm fields. The 5.00 pay differential causes the companies to be able to afford regular American workers. If $5.00 is not the right number then it is changed to a number that favors Americans over non-citizens. Many of us have been out to the blogs and we get a chance to catch the unabashed feelings of Americana. The blogs have been really buzzing since Obamacare passed. Not only do a lot of healthy Americans not want to buy insurance but they are annoyed that they will be paying for many people who for one reason or another choose not to contribute to society and who are content to take, take and take. These folks are not only concerned about Obamacare but the next step, a shamnesty, which then compounds the financial distress of Obamacare by adding 30,000,000 illegal aliens and their families to the welfare rolls and to the Obamacare rolls. These folks suggest that those on welfare should replace the farm workers who choose to go back to wherever they are from. Not a bad idea! "... Why are we questioning if we should be accepting things that are illegal. If we bend the rules for one group or action, then we have to bend the rules for all or it would be 'selective enforcement' which in itself is illegal. I agree. Able-bodied welfare recipients should take the low-paying jobs. If they do not like them, it will serve as incentive to work toward something they would enjoying working at. Welfare was originally meant to assist people back up on their feet. It was not meant to be a source of life-time income."